HIGH COUNTRY!! 6.2L V8!! CREW!! 4WD!! NAVIGATION!! SUNROOF!! POWER RETRACTABLE RUNNING BOARDS!! HEATED/COOLED LEATHER SEATING!! 22 INCH RIMS!! SURROUND VISION!! 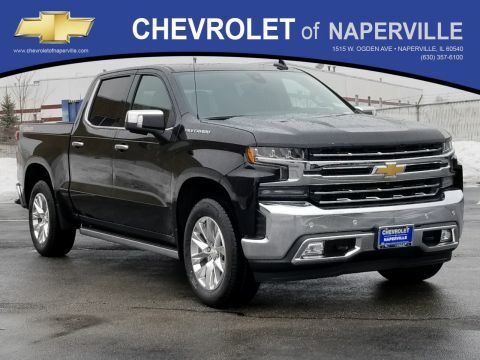 2019 CHEVROLET SILVERADO 1500 HIGH COUNTRY 4WD CREW CAB, BLACK ON JET BLACK/UMBER HEATED/COOLED LEATHER SEATING, 6.2L ECOTEC3 V8 ENGINE UNDER THE HOOD, 10-SPD AUTOMATIC TRANSMISSION, TRAILER BRAKE CONTROLLER, 20 HWY MPG!! LETS GO OVER ALL THE OPTIONS ON THIS ALPHA DOG OF THE TRUCK WORLD!! HIGH COUNTRY DELUXE PACKAGE INCLUDES: FORWARD COLLISION ALERT, LANE KEEP ASSIST WITH LANE DEPARTURE WARNING, LOW SPEED FORWARD AUTOMATIC BRAKING, FRONT PEDESTRIAN BRAKING, INTELLIBEAM HEADLAMPS, FOLLOWING DISTANCE INDICATOR, SAFETY ALERT SEAT, POWER GLASS SUNROOF, 22 INCH POLISHED ALUMINUM WHEELS, AND ALL-WEATHER FLOOR LINERS, TECHNOLOGY PACKAGE INCLUDES: HD SURROUND VISION, REAR CAMERA MIRROR, HEAD-UP DISPLAY….YOU WANT MORE….WE GOT MORE….CHEVYTEC SPRAY-ON BEDLINER, POWER RETRACTABLE RUNNING BOARDS, DUAL ZONE CLIMATE CONTROL, WIRELESS CHARGING FOR YOUR SMART PHONE, 8 INCH COLOR TOUCH SCREEN WITH NAVIGATION, POWER UP/DOWN TAILGATE, ADVANCED TRAILERING SYSTEM, BOSE PREMIUM SOUND, 4G LTE WI-FI HOTSPOT, DUAL EXHAUST WITH POLISHED TIPS, 2 USB PORTS, HEATED 2ND ROW SEATING, HEATED STEERING WHEEL, REMOTE STARTER, KEYLESS OPEN AND START OF TRUCK, 10 WAY POWER DRIVER AND PASSENGER SEATING…..LADIES AND GENTS THE LIST GOES ON AND ON….LETS JUST SAY THIS ON IS LOADED UP AND READY TO GO!! 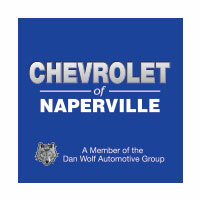 NOW…SOME CHEVY WARRANTY….YOU GET A FULL 36 MONTH OR 36,000 MILE BUMPER TO BUMPER COVERAGE GOOD FROM THE DAY YOU TAKE DELIVERY, PLUS A 5 YR OR 60,000 MILE POWERTRAIN COVERAGE, ALL AT NO ADDITIONAL COST TO THE MOST IMPORTANT PERSON…YEP…YOU GUESSED IT…THAT’S YOU!! 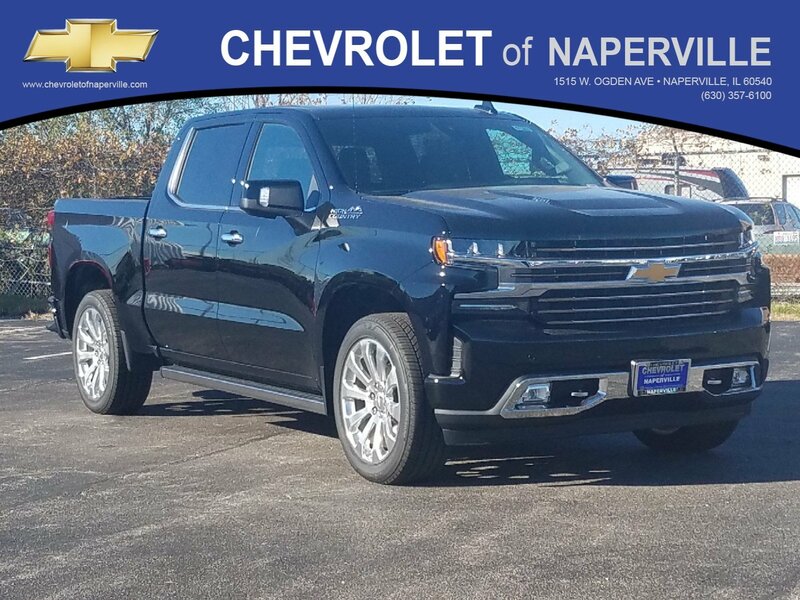 COME ON DOWN TODAY AND TAKE THIS LOADED UP SILVERADO FOR A SPIN AROUND OUR WORLD CLASS CHEVROLET OF NAPERVILLE TEST TRACK!! FIRST ONE HERE WINS….SEE YA SOON…ONE LOW PRICE, PLAIN AND SIMPLE…ALWAYS!! Must finance through General Motors Finance. HIGH COUNTRY!! 6.2L V8!! CREW!! 4WD!! NAVIGATION!! SUNROOF!! POWER RETRACTABLE RUNNING BOARDS!! HEATED/COOLED LEATHER SEATING!! 22 INCH RIMS!! SURROUND VISION!! 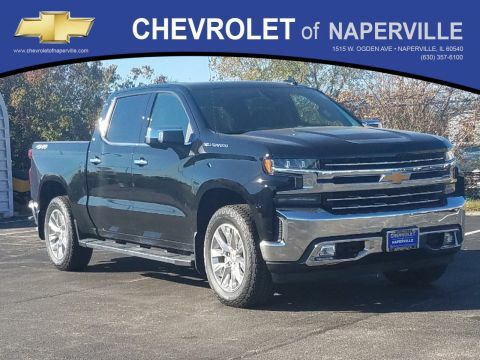 2019 CHEVROLET SILVERADO 1500 HIGH COUNTRY 4WD CREW CAB, BLACK ON JET BLACK/UMBER HEATED/COOLED LEATHER SEATING, 6.2L ECOTEC3 V8 ENGINE UNDER THE HOOD, 10-SPD AUTOMATIC TRANSMISSION, TRAILER BRAKE CONTROLLER, 20 HWY MPG!! LETS GO OVER ALL THE OPTIONS ON THIS ALPHA DOG OF THE TRUCK WORLD!! HIGH COUNTRY DELUXE PACKAGE INCLUDES: FORWARD COLLISION ALERT, LANE KEEP ASSIST WITH LANE DEPARTURE WARNING, LOW SPEED FORWARD AUTOMATIC BRAKING, FRONT PEDESTRIAN BRAKING, INTELLIBEAM HEADLAMPS, FOLLOWING DISTANCE INDICATOR, SAFETY ALERT SEAT, POWER GLASS SUNROOF, 22 INCH POLISHED ALUMINUM WHEELS, AND ALL-WEATHER FLOOR LINERS, TECHNOLOGY PACKAGE INCLUDES: HD SURROUND VISION, REAR CAMERA MIRROR, HEAD-UP DISPLAY....YOU WANT MORE....WE GOT MORE....CHEVYTEC SPRAY-ON BEDLINER, POWER RETRACTABLE RUNNING BOARDS, DUAL ZONE CLIMATE CONTROL, WIRELESS CHARGING FOR YOUR SMART PHONE, 8 INCH COLOR TOUCH SCREEN WITH NAVIGATION, POWER UP/DOWN TAILGATE, ADVANCED TRAILERING SYSTEM, BOSE PREMIUM SOUND, 4G LTE WI-FI HOTSPOT, DUAL EXHAUST WITH POLISHED TIPS, 2 USB PORTS, HEATED 2ND ROW SEATING, HEATED STEERING WHEEL, REMOTE STARTER, KEYLESS OPEN AND START OF TRUCK, 10 WAY POWER DRIVER AND PASSENGER SEATING.....LADIES AND GENTS THE LIST GOES ON AND ON....LETS JUST SAY THIS ON IS LOADED UP AND READY TO GO!! NOW...SOME CHEVY WARRANTY....YOU GET A FULL 36 MONTH OR 36,000 MILE BUMPER TO BUMPER COVERAGE GOOD FROM THE DAY YOU TAKE DELIVERY, PLUS A 5 YR OR 60,000 MILE POWERTRAIN COVERAGE, ALL AT NO ADDITIONAL COST TO THE MOST IMPORTANT PERSON...YEP...YOU GUESSED IT...THAT'S YOU!! 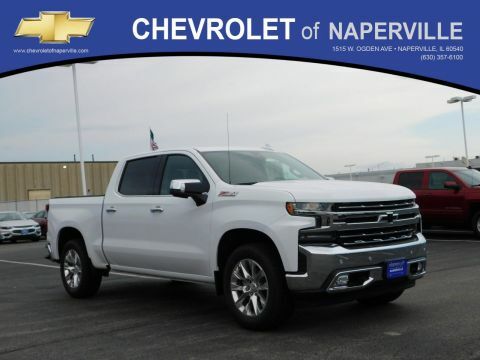 COME ON DOWN TODAY AND TAKE THIS LOADED UP SILVERADO FOR A SPIN AROUND OUR WORLD CLASS CHEVROLET OF NAPERVILLE TEST TRACK!! FIRST ONE HERE WINS....SEE YA SOON...ONE LOW PRICE, PLAIN AND SIMPLE...ALWAYS!! Must finance through General Motors Finance.